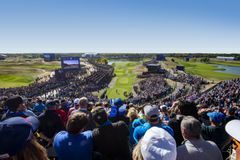 Propelled into the spotlight by Europe’s awesome Ryder Cup victory in 2018, Le Golf National has cemented itself as a must-play European golf course. The club has two spectacular courses to play, L'Albatros and L'Aigle, the latter of which makes for a memorable round of golf in its own right. However, after the world watched ‘Moliwood’ put on a historic performance upon its fairways, L'Albatros has become the most popular course in France. Thanks to its great location on the outskirts of Paris, Le Golf National is within easy reach of golfers traveling from the UK, choose from the Eurostar, a drive via the Eurotunnel or a flight into Orly or Charles-de-Gaulle Airports. Golfers are also spoilt for choice with accommodation, with a number of excellent hotels available, including the Novotel Saint Quentin Golf National. We found 14 offers matching your search. L'Albatros is Le Golf National's centerpiece, and is the annual host to the French Open. Ranked 4th in France and 9th in continental Europe, L'Albatros was designed by Hubert Chesneau, and has hints of Florida, a splash of Ireland and a lot of France. The stadium course has been built in accordance with the most modern construction principles and is staging the Ryder Cup in 2018. This is the toughest golf course around Paris, where the enormous, undulating putting surfaces are sculpted around great swathes of water and sand. The distinctly rugged feel of L'Albatros reminds you that this is a proper golf course, not a walk-in-the-park resort track, and is there to test even the best. Thongchai Jaidee claimed his 8th European Tour victory with a -11 total in the 100th edition of The French Open. Despite a stellar field including Rory McIlroy, Martin Kaymer and Lee Westwood, Jaidee was able to take the title courtesy of a brace of 68's over the weekend. His closing bogey on 18 was enough for a 4 shot victory over Francesco Molinari who finished strongly with birdies on 17 and 18 in a final round, best of the day, 66. The 17th hole again proved tricky, yielding just 5 birdies all week as the par-4 took top spot as Le Golf National's hardest hole. A -13 total for Bernd Wiesberger was good enough to claim The French Open by 3 shots from Surrey's James Morrison. A closing round of 65 (-6) saw Wiesberger become the first Austrian to win on The European Tour and also claim the 500,000 euros first prize. The closing stretch of holes in 15, 16, 17 and 18 proved pivotal during the week with the par-4 18th hole ranking as most difficult over the 4 days, whilst 15 and 16 were tied as 2nd most difficult with the 484 yard par-4 17th yielding just 6 birdies all week to rank as the 6th most tricky. Graeme McDowell produced a superb final round to overturn an eight shot deficit and successfully defend his French Open crown. The Northern Irishman carded a closing 67, the joint-lowest round on a wet and windy day, to win by a single stroke. American Kevin Stadler had a two-footer for par to force a play-off, but missed, leaving him tied for second with Thailand’s Thongchai Jaidee at four-under par. The resort's second course is L'Aigle, which is certainly a more forgiving proposition than the neighbouring French Open venue. L'Aigle is shorter, at 6,489 yards, and is more sympathetically set up to welcome the average player. In the same manner as L'Albatros, the course is rough around the edges, and has a degree of links in its make up, but does not have the demanding hazards that make Le Golf National's main attraction so challenging. In addition to the championship courses, Le Golf National has a charming little nine hole layout called L'Oiselet. Although short, the greens are demanding, making it useful for skilled golfers, as well as being a good stage for youngsters and those still mastering the finer points of the game. Pro shop price is a little high. Staff very helpful. The course looked tired after the winter, greens very hard and unreceptive and quick. Many areas suffering after the high foot fall and facilities needed for the Ryder Cup. This is a wonderful experience it really is and the course is superb. The staff at the course are also superb they really are, very friendly and informative about the facilities. One draw back was the practice range was closed but, there is a good chipping/pitching facility as well as excellent putting green. A really superb experience. The whole course was excellent, from the 1st to the 18th. Plenty of challenging holes so make sure to get some practice in before you play. My Caddy Tip - "Keep it away from the water!" Very enjoyable experience. Great course and good company. My Caddy Tip - "Long and tough, choose your tee's wisely!" It is a very demanding course that requires distance off the tee as well accuracy with some extremely tight holes. My Caddy Tip - "Hit it Long & Straight"
The last 4 holes are an extremely good test of golf and will definitely be great matchplay holes for The 2018 Ryder Cup. My Caddy Tip - "Make to take plenty of club on your approach shots"
15th was a great hole, keep it on the fairway! Enjoyable golf course at Le Golf National, look forward to watching The Ryder Cup being played here in 2018. My Caddy Tip - "Essential to keep the ball in play"
2nd time we've been to Le Golf National, would recommend it as a golf holiday destination to all due to it's easy reach from the South of England and the great value it offers. The hotel is ok with quite a modern look / feel and obviously next to the golf course which makes things very easy. A real hidden gem, I don't know why more people from the UK don't travel here for a golf trip. The courses are fantastic and a real challenge, we've driven each time and whilst it is a long distance from Calais the roads are clear and it is relatively simple. 33 points is normally enough to win our tournament, the course is a real test. How far is Le Golf National from Calais? It takes around 3 hours to drive from Calais to Le Golf National and is just under 200 miles. Many golfers opt to break up the journey by playing other courses along the way in Normandy.